Was OS X ever really more secure than Windows? 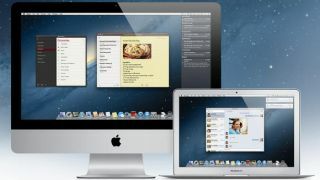 Apple's Mac OS X computers have long been considered more secure than their Windows competitors, but that misconception likely arose from the fact that Apple junkies have historically made up a mere fraction of overall PC users. Oh, and also from Apple's own rhetoric, which has consistently attempted to paint OS X as an impenetrable fortress of safe computing. But the growing number of Apple users has made the system an ever-more attractive target for hackers and digital miscreants, as this year's earlier trojan attacks (one and two) made clear. Now that rhetoric is being quietly altered (it's not exactly the kind of thing you shoot out a press release for, is it?). Apple's official OS X page has been somewhat subtly altered in what appears to be an attempt to tone down the company's previously outlandish claims. What used to read "It doesn't get PC viruses" now says "It's built to be safe." "A Mac isn't susceptible to the thousands of viruses plaguing Windows-based computers. That's thanks to built-in defenses in Mac OS X that keep you safe, without any work on your part," the site used to read. However, that text has been replaced with: "Built-in defenses in OS X keep you safe from unknowingly downloading malicious software on your Mac." The new statement places the blame at users' feet (where it belongs) if anything goes wrong, while no longer pretending that users don't have to put any effort into developing safe internet habits and being smart. Likewise, another page that previously read, "Safeguard your data. By doing nothing," now says: "Safety. Built right in." More and more PC users are turning to Apple rather than Microsoft for their OS needs, and Apple could be altering their branding so as not to give customers a false sense of security. Especially in light of this year's large-scale trojan attacks, it's becoming clear to everyone that OS X isn't as safe as some may have thought. Apple's new stance on security can certainly be viewed as more realistic, though it may or may not necessarily point to a larger change in consumer strategy for the company. TechRadar reached out to Apple for comment regarding the company's new down-to-Earth attitude, and this story will be updated if they respond.